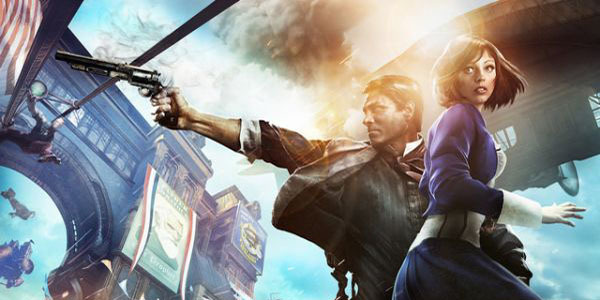 Bioshock Infinite is one of those games that upon finishing will put you into a daze for the foreseeable future. The story that unfolds as you play through the epic sky city of Columbia is riveting, insane, entertaining, and out of the box crazy! There are a lot of great aspects of this game that I found to be exciting but I couldn’t shake the thought out of my head that I’ve collectively seen all of these aspects somewhere else. That somewhere else I’m referring to is the undoubtedly confusing 2001 Richard Kelly science fiction film: Donnie Darko. DD had most people scratching their heads by the end of it’s one hundred and thirteen minute run and had the remaining people fibbing about how they understood everything right off the bat after their first go. Both Infinite and Darko share some of the same aspects that I couldn’t keep out of my head and this article is my way of getting it out there! I do want to include, and I cannot stress this enough, that this list is just my own personal opinion and I welcome, scratch that… I encourage you to respond below and tell me your thoughts! I’m not claiming to know the full extent of Darko’s story but I understand enough to pen this article and the same goes for Infinite. NOTE: Post will contain major spoilers! The post 4 Aspects Bioshock Infinite Shares With Donnie Darko appeared first on WhatCulture!.